The concept of Bistro 9 is very refreshing. All the dishes cost 9 euro en have the size of a starter. You can decide on various dishes the many you like. And it's certain you'll want to try a lot of them because this chef creates magic in the kitchen. His focus is on the French cuisine with a modern twist. Ik ben verrast dat dit restaurant geen Michelin-sterren heeft. Het eten en de wijn is subliem en de vriendelijkheid van het personeel is professioneel, maar toch warm. Een van mijn favoriete restaurants in Nederland. I'm surprised that this restaurant doesn't have Michelin stars. The food and wine is sublime and the friendliness of the staff is professional, but yet warm. One of my favourite restaurants in the Netherlands. Lovely ambiance, delicious cuisine, perfectly timed service with a smile. All the ingredients for a delightful dinner out! Prima eten, perfecte bediening en leuke entourage. Lovely bistro and delicious food. All small dishes for € 9 each, so you don't have to eat too much, or you can always have an extra course. We can thoroughly recommend the duck breast with mushroom 'stamppot' and beef stew rice. The albacore raw tuna was also great! Good selection of wines and altogether a great experience. We will be back! We had an incredible meal at one of our favourite restaurants. The food was out of this world delicious... perfect. I find the service sometimes rather slow because they don't always have enough people when the restaurant is full. But then again, it gives the chef more time to work his magic. The bread to nibble on keeps you occupied. It's better to order several courses at the same time, the portions are small. This is not a place to go to for a quick meal, but the service is always delicious and personal. It's a nice touch that the chef often comes out to the tables to receive feedback from the diners . I love the decor of the restaurant. I believe it's the old barn from "Jasper" from the 1800's, but I'm not sure. They decorated it very nicely and in the summer, the dining patio in front of the restaurant is very nice. Bistro 9 is an excellent modern French restaurant. The concept here is very simple. There are nine dishes on the menu, each costing €9. Additionally, there are three specials, again costing just €9. Collectively there's an excellent selection of meat and fish dishes, a couple of vegetarian options and not forgetting desserts. Choose as many dishes as you want (we chose two each at first and made another selection later on). These are served to you one at a time and with sufficient space in between 'courses' to allow you to digest and relax. It's worth making it clear that this is not tapas-style dining. Portions are smaller than standard restaurant main courses, but much more generous than tapas-styl dishes. The whole point is that you'll have the luxury of tasting three different dishes, maybe four if you're especially hungry or are a big eater. By the way, delicious bread rolls and a bottle of chilled tap water are provided free of charge. Yes, free. After an aperitif and an explanation of how the straightforward menu system works, we opted for three each, which were: sea-fresh Zeeland oysters (from the specials board), filet of smoked trout, lightly curried beef and sweet potato in a pastry tart (also from the special's board), baked Dover sole, blood sausage (black pudding, sausage style and made to a family recipe), and a parmesan mousse served with a balsamic syrup and thinly rolled wafers. In addition, we ordered a portion of hand-cut potatoes, which were flavoured with rosemary. Without exception, every dish was superb. A quick comment about the wines: too many restaurants "forget" that house wines should be a refection of the quality of the establishment as a whole and instead they offer "cheap plonk" to customers. 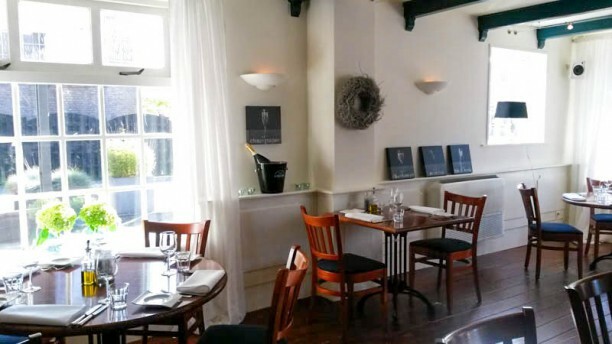 Bistro 9, however, takes great pride in its wine selection and the house red – Cuvée Laborie Carignan Rouge Vieilles Vignes Languedoc (South of France) – is not only outstanding, but at €18.50 a bottle it represents unquestionably good value for money. So, two aperitifs, six excellent dishes, one side order of potatoes, one bottle of superb house wine and complimentary bread and bottle of tap water. Total cost: €88.25. Great! We liked our first experience of Bistro 9 very much indeed. The food is great, the service can't be faulted, and the environment is cosy and classy all at the same time. We recommend it highly and for sure, we'll be back.